I have been away for awhile roaming the landscape of the Skagit to create a new series for an upcoming solo show at Perry and Carlson in March. 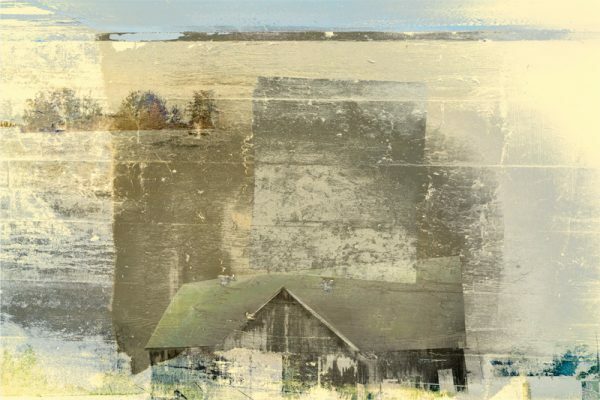 The new work, which I am calling “Industrial Pastorale,” is a very personal evolution of imagery that explores the liminal edge between rural and urban landscape. I grew up in two households, one in the inner city and one in what was then very much “the country.” The sprawling horse ranch where I spent every other weekend and summers with my father stretched out luxuriously, field after field, divided only by a single lane, fence posts and the natural undulations of the land, which led to blue foothills and then dropped off into the back forty and from there to the cliff above the Green river. Above it all towered Mount Rainier, and in memory the light is sometimes the shimmer of reflected snow. That landscape is now carved and chopped up and filled with houses and ranchettes where as someone once put it, “The dentist who bought the 5-acre and built the 4,000 square foot log house? his wife holds “moon circles” now. Moon circles what is that?? They all wear long skirts and look up and sing but I don’t know what they call that singing for.” When I grew up on the farm the main thing looking up at the moon was the coyotes. When you heard them late at night it gave you chills, and you stayed inside because. Skunks and porcupines. Just try washing skunk out of your overalls, or tweezing porcupine quills out of a beagle’s nose. As I get older and reflect on childhood it startles me to see how much the farm influenced my perspective on the world and the media I have chosen for my work. I live in photographs, and my art is always preoccupied with the tension between the real and the unreal, the past and its erasure. In the farmhouse, over the TV, which sat on a braided rope rug, the ancestors presided in gilt frames and starched collars and white buns. The two of them in their hand-tinted soft fog of photo emulsion pervaded the entire house, including Lawrence Welk and his Champagne Music Big Band, with stern judgement. A blue willow plate sat on the book case, a reminder of pioneer grandparents and covered wagons. This reward for the journey West always held the same enchanted kingdom printed in blurred blue: a bridge, a weeping willow, birds, three men, a pagoda and an island. In the kitchen was another plate, small, unobtrusive, that pictured a countryside of idealized hillocks in green oxide; over the farthest hill came an equally idealized city, with smokestacks and plumes of industry mixing with scalloped clouds. That little plate was an incendiary bomb, portending the actual future in which we live. Visit the Green River Valley and you will find a corridor of mini self-storage warehouses and suburban sprawl. I don’t know where the cougars or the salamanders or the cattails went, although there are still a few vintage used car lots. So when I rebuild my memory I cannot go to the actual place, I have to go the remaining Arcadia we still have, and that takes me to the Skagit Valley, where there are barns. There is a reason why artists have been drawing and painting barns forever. They are an archetypal structure of utility and aspiration that always seems at home in the landscape. Even knowing the reality behind the picturesque you can still be helplessly in love. As a child I cleaned stalls and I pushed a wheelbarrow tipsy with urine-soaked straw. I sifted lime, I stacked bales, and I swung from a rope swing above a canyon of hay dust. The smell of tack rooms and white wash and lime is in my DNA. Few things affected me like the day I returned to the farm to show a friend that barn of my childhood, only to find it gone: a cathedral-sized memory flattened to a concrete slab. 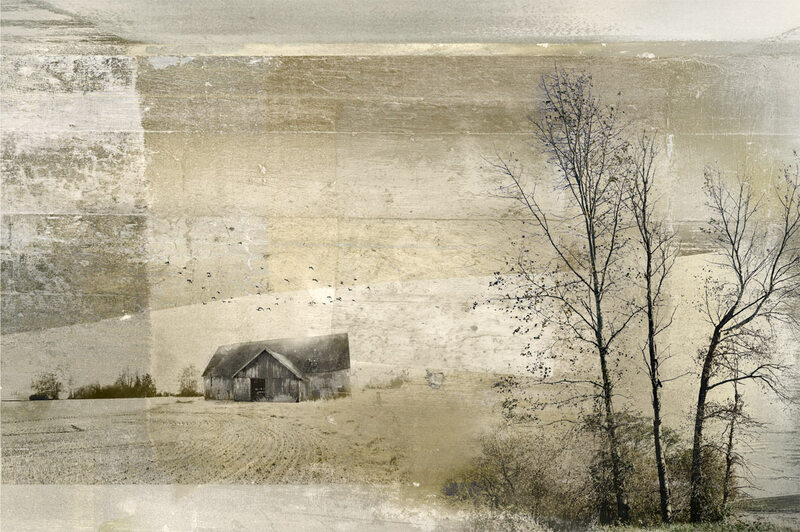 As I develop this new work there will be many barns. I am looking at different ways of blending the industrial with the rural (and what is farming, by the way, if not industry?). I do love Wallace Stevens’ approach, looking at one thing 13 ways. There will blendings and juxtapostions and moments of pure just-this. The two new prints here merge the texture of the Aurora Bridge with landscape. The concrete forms of the bridge are themselves antique, built with planks of wood from 1930, which left their indelible pattern. All highways, it would seem, lead to the past as well as the future. A little note on influences here: if you have not seen the Andrew Wyeth retrospective at SAM yet I urge you to go. Such reveries of surface and representation! I had not seen any of these paintings outside of books, and Wyeth’s abstract handling of paint took me by delight and surprise. He is a master of the subtle detail and the limited palette. I thought of him many times as I built up the values of these quiet landscapes. Keep up with my latest news by following me on Facebook and on Instagram. Thank you for reading!